Greetings Nerd Lifers, Gen Con, America’s largest gaming convention has come to an end. I have spent the past few days meandering through narrow corridors lined with vendors and jam packed with over 61,000 people to bring you the latest news in exciting board games and card games! I have such sites to show you! Let us begin! Minion Games quickly sold out of copies of their Manhattan Project board game. A very interesting theme where players place their workers efficiently to help the United States Manhattan project create the worlds first nuclear weapon. An impressive and fun game that also teaches a fascinating history lesson. I wish there were a lot of positive things I could say about Jasco’s Mega Man game. They did absolutely everything they could to pack as many tributes to one of my favorite video game franchises as possible but didn’t focus enough on making an engaging board game. The miniatures are absolutely stellar, the artwork is impeccable, and the component quality is top notch. All of the delays this game has been facing over the past few years involve the perfectionism of Capcom having a strong hand in the development of the miniatures and overall look of this game. If more attention was payed to the actual game design aspect of Mega Man than the aesthetic we would have a huge hit. The gameplay is a lot like the final few turns of Munchkin where everyone is playing negative modifiers against one player taking on the role of Mega Man who tries to play a bunch of cards to give positive modifiers all while gambling the amount of dice they will need to roll for a success on their mission. There are many long rounds of this until a player can finally make it far enough to fight a boss battle that has the exact same mechanics as all the rest of the turns. After doing this long nearly hour long process you will have to repeat it with at least 3 other mini bosses to even have a chance at taking on the big boss Dr. Wily. The person doing the demo stated that this process would only take about an hour to an hour and a half but I honestly do not see a way this game could be finished in less than four tedious hours. It is a terrible shame that such a great property is ruined by such tedious gameplay. The high price tag of $80 will get you some awesome miniatures and maybe you can make your own rules to fix where this game went so wrong. Jerry Hawthorne of Plaid Hat Games gave me a look at Tail Feathers, an aerial combat game based in the popular Mice and Mystics Universe. In the bottom image you can see that they are employing an interesting mechanic where you can swivel your miniature to bank in the direction you intend to go. This will play heavily into the strategy of the game which looks to have a lot in common with the Xwing and D&D Attack Wing Miniatures games. One of the best games I played all week was Champions of Hara. This game has steampunk adventure and Kung fu fighting all rolled into a beautiful constantly changing colorful universe. I highly suggest getting in on the December pre order for this one. Being a huge fan of the Mouse Guard comic I had to check out Swords and Strongholds, a game played in the legends of the guard stories. The game is very abstract and tactical and definitely rewards smart play but the $30 price tag kept me away from a game that has so few components but a price drop might be worth the splurge. This was a great 2 player drafting game with stellar art and a good price at $12. Lots of replay and hard decisions to make each turn. Every couple needs a game like this in their collection. 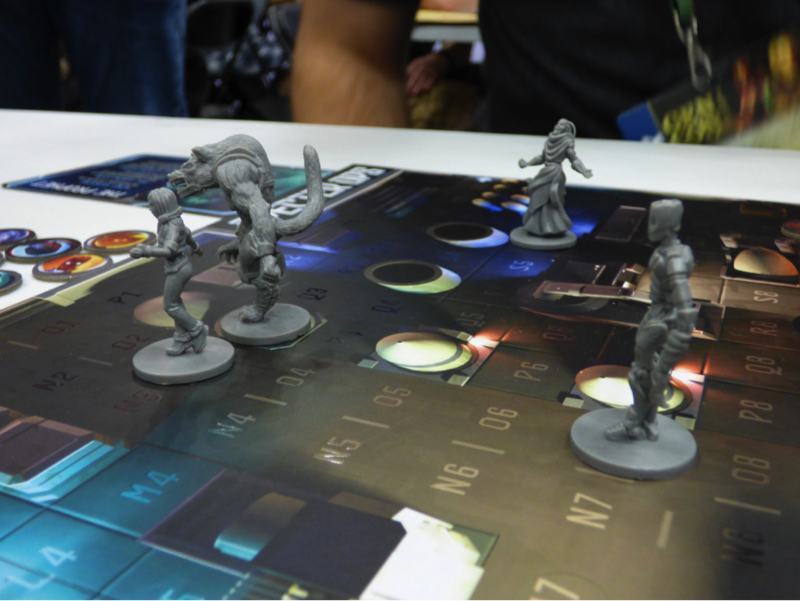 I'm a big fan of hidden movement games like Nuns on the Run and Letters to Whitechapel. This game might have them all beat. A rogue agent must infiltrate a top secret facility and access a certain number of targets before he is captured by a group of super powered hunters. The tension in this game was high from the beginning and escalated all the way to a climactic finish on the last possible turn. This game will find a spot on my shelf. I hope you enjoyed the first part of my coverage of Gen Con! Keep your eyes peeled for the next installment of my Saturday + Sunday activities as well as reviews of games that I took home from the con!